Romeo is a larger and more capable version of the Nao robot, and is now under construction by Aldebaran Robotics (which is based in Paris, not in Taurus). 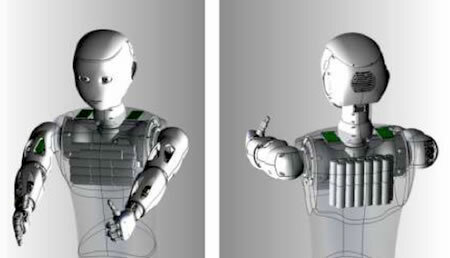 A computer-generated rendering of the 1.4 meter robot, which should be available in the spring of 2011 to researchers, is shown below. Romeo is intended to serve the needs of elderly and disabled individuals right in their own homes. Aldebaran hopes to introduce such innovations as four-vertebra backbone, articulated feet, a partially soft torso, a composite leg exoskeleton, and a new kind of actuator that lets the robot control its limbs in a safer way. EG: Why build a human-shaped robot? RG: My ideas about this are changing regularly. So I’ll give you my opinion today. I think that a humanoid robot is very useful if you want to have a multipurpose robot. If you only want to have a vacuum cleaner, it’s good enough to have a little cylinder robot. But if you want a robot that can open the refrigerator, grab a bottle of water, pour water into a cup, and take the cup to another room, being a little cylinder is not very helpful. If you want to do plenty of things, then you have to have plenty of robots, or one robot able to do lots of things. There’s also human-robot interaction issues. I think that people will find a humanoid much easier to use and much more fun than a Roomba or a kind of box on wheels robot. Many people don’t want just a slave robot; they want a machine that works like a companion, and so it's helpful if your robot has a certain height and a face that people can look at and talk to in a natural way. That’s why a humanoid shape is interesting. Does it need legs? We’ve discussed that a lot. Legs and wheels both have advantages and disadvantages. We decided to use legs because we think it’s more convenient and adaptable for most situations. And also because it's a big technological challenge. But that's my answer today. It may change tomorrow! EG: What are some of the things you envision Romeo doing? RG: We have some scenarios. For example, imagine that Mr. Smith lives alone and has a Romeo in his house. Because Mr. Smith is elderly, he might forget where things are, like his glasses or the remote control of the TV. But the robot can constantly keep track of these objects, using its vision, and it doesn’t forget where they are. So Romeo can assist Mr. Smith to find objects and even go get them for him. "Irma Vincent Gordon," Andrews murmured. He glanced up. "Is that right?" The old woman did not move. "She is totally deaf, sir," the robant said.